No, it is not the number of megapixels. Although that is important. Camera manufacturers have long understood that people look at megapixels first, and they have occasionally been guilty of cramming a bunch of megapixels in a camera without regard to other factors, including the one I want to talk about. The result was cameras with lots of megapixels but poor picture quality. Rather, the first thing to look at is the size of the digital image sensor. Nothing else has as much effect on picture quality. The image sensor is the device in your camera that captures the image from the light being reflected upon it by the lens. It does essentially the same thing that film did back in the old days. Just like there was different sized film, there are different sized image sensors. When it comes to an image sensor, bigger is better. There are complicated technical reasons for this, but they boil down to larger pixels being better than smaller pixels. Frankly, that’s about as technical as I want to get with it. But if you cram 16 megapixels on an image sensor the size of your fingernail, the result is a lot of noise and poor image quality. Conversely, if you stretch those 16 megapixels out over an image sensor the size of a tablespoon, the image quality is vastly improved. Another way to think about this is to consider the effect of the enlargement that is going on between your image sensor and your final picture. When you take a picture, you start with a small image in your camera (the size of the image sensor) and you are ultimately going to take that small image and stretch it out to the size of either your computer screen or to a print. That is always going to result in enlarging the image several times, usually many times. The less you have to stretch out those pixels, the better. A larger image sensor means there is less enlargement or stretching out of the pixels to get the final picture. Therefore, the quality will generally be better. Now that you understand the importance of image sensors, it is time to talk about what size sensors are in what cameras. Not surprisingly, bigger and more expensive cameras have larger image sensors. Smartphones and point and shoots have really, really small image sensors. To give you a good idea of the kind of differences we are talking about, below is a chart with the most common sensor sizes: As you can see, iPhones (and other smartphones) and point and shoot cameras contain very small digital image sensors. No matter how many megapixels the manufacturer includes in the camera, the small image sensor limits how good the picture will be. Of course, the smaller sensor has an upside in portability as well. On the other end of the camera-spectrum, most DSLRs contain APS-C sized sensors and the higher end DSLRs have “full frame” sensors. 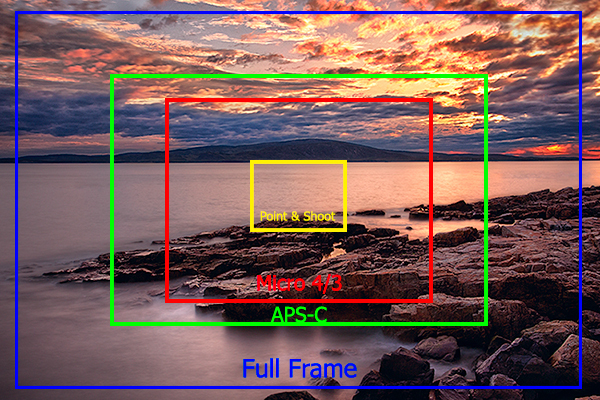 “Full frame,” by the way, means that the image sensor is the same size of a piece of 35 mm film. Although bigger is better, you will pay for it. As you probably know, you can get a nice point and shoot with the corresponding small image sensor for only a couple hundred bucks. Conversely, the cheapest full frame camera on the market is about $2,000 and they go up to about $7,000. If you really want to get crazy, you can look at medium format sensors. And “look” is probably all you will do, because the absolute cheapest digital medium format camera is about $7,000 and they go all the way up to about $40,000. But the good news is that cameras with smaller lenses are of high enough quality these days that it doesn’t make sense to spend the money on medium format (unless you are blowing up your pictures into billboards). Now let’s talk about another effect of different sensor sizes, and that is crop factor. You already know that a camera operates by allowing light to come through the lens and reflect onto the image sensor to create an image. But what happens when that same light reflects on a smaller image sensor? In other words, assume we have two identical cameras, but one has a smaller image sensor than the other. How is the resulting image affected? This shows the size of the area captured by cameras with different sensor sizes. The result is that everything looks more “zoomed-in” on cameras with smaller image sensors. In fact, because everything looks zoomed-in, crop factor is referred to as a degree of magnification of full frame cameras. Most APS-C cameras have a “1.6x” crop factor, for example. That means the sensor is covering about 60% less area so everything looks 1.6 times closer than if you were using a full frame camera. The crop factor numbers get higher as the sensor size gets smaller. This does not mean that cameras with smaller sensors only take pictures with large focal lengths though. The “crop factor” can be counter-acted by buying wider lenses, and in fact, the camera manufacturers have all introduced lenses designed for cameras with these crop factors. Image quality isn’t the only thing that is affected by the size of the image sensor. There are other effects as well, and perhaps the most striking is depth of field. You are able to achieve a much shallower depth of field with larger image sensors. Basically, the bigger the image sensor, the shallower the depth of field it will achieve. Now that we have looked at the effects of the size of the image sensor, you may be wondering which one is best for you. As I stated, bigger is better, but still you have to think about bang-for-the-buck here. I personally recommend something like an APS-C sensor size if you are starting out. The prices of many APS-C cameras are pretty reasonable, and the size is plenty big. 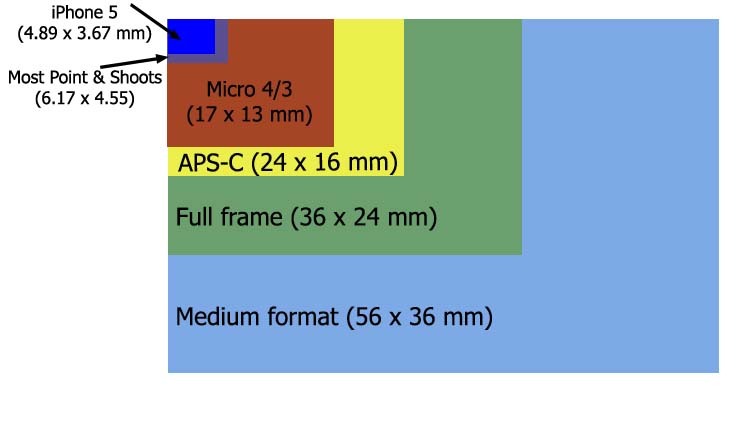 That’s not to say a Micro 4/3 sensor is too small, particularly if you are just posting to the web, but the APS-C won’t cost you more so I think getting the bigger sensor is a good idea. Going full frame, while it can be nice, might be a little extravagant if you are just starting out. I think that is something to look at down the road if you are truly going to get more seriously into photography. Sensor size is not the only thing to look at, just the first thing. From there you can look at things like megapixels, low-light performance, focus speed, etc. If you are in the market for a camera, I recommend you check out the recommendations we have and also go through the 5-step program to help you pick out a DSLR.